A main point to cover with this Presentation is that Mira Atkeson was an amateur photographer. It is highly probable that her famous husband, Ray Atkeson, gave Mira many helpful tips. Yet, it is remarkable that Mira’s skill level was occasionally an important asset to her husband’s professional career. Be sure to include the two examples of this important point, told in the words of her husband, under Evergreen Trees in a Coastal Rain Forest, by Ray Atkeson. There are only two Ray Atkeson Photographs included in the Packet. This is because the focus is on his wife, Mira, the amateur photographer. Use the Ray Atkeson photographs for comparison. Mira’s photographic skill was equal to her professional husband in many ways. “Amateur photographers” might be the way that you choose to refer to the kids in the class, if they take pictures for the project this month. There are many opportunities, during your classroom discussions, to teach and/or review the important difference between LINE TYPE and LINE QUALITY with Grades 3-5. Take a couple of minutes each month to define and discuss LINE TYPE and LINE QUALITY, as it is vitally important that Grades 3-5 understand these. There are 5 LINE TYPES: vertical, horizontal, diagonal, curved, and zigzag. LINE QUALITY describes the appearance or width of any line. Some examples of line qualities might include: thick, thin, rough, crooked, straight, angled, long, short, light, or dark. COLOR is a valuable art element to teach with this packet. Painting Color Wheels is recommended. There are two different types of Color Wheels for elementary kids—Primary & Secondary (Grades 1-3) and Intermediate or Tertiary (Grade 4). Outlines for both can be found in Art Basics and run off on cardstock for kids to paint. Kids could also paint the colors on separate small pieces of cardstock. After each color has been mixed and painted, kids create a SHAPE pattern (flower, leaf, or triangle) they can cut from each color. Shapes should be arranged (in the correct order-refer to Color Wheel outlines) and labeled on a large circular background. Make sure ALL 10 pictures are returned to the Packet Carrier after your Presentation is finished. Ray Atkeson was born in Grafton, Illinois, on February 13, 1907. He began his photography career while still in high school. After graduating, Ray worked in the wheat fields of Kansas and Nebraska, and picked apples in the Hood River Valley of Oregon. He was still a young man when Atkeson finally decided to take up his camera again to capture the beautiful scenes he had been seeing across the country he had traveled. Ray Atkeson spent the first twenty years of his career photographing in black and white. He became especially well known for his stunning black-and-white images. Ray and Mira met in Portland, Oregon in 1927 and married in 1930. Ray and his wife traveled to photograph landscapes in Europe, Hawaii and the American West, especially Oregon, where he and Mira lived for many years. The Atkesons maintained two homes—one on the Oregon Coast and the other in Portland, overlooking the Willamette Valley, with their beloved Cascade Mountain Range on the horizon. During the 1930’s, Atkeson’s career began to flourish and he was widely published. Work reproduced in newspapers around the United States brought the dramatic mountains and ski country of Oregon to a wide audience of Americans for the first time. In the 1950’s, interest in black and white photography was substituted by new color film. Atkeson stored his black and white negatives in a vault, where they remained untouched for nearly fifty years. Toward the end of his life, Atkeson began printing these negatives again, a project that continues today, even after his death, which was in 1990. Among the many awards Ray Atkeson received during his lifetime are Distinguished Citizen of Oregon; an Honorary Doctorate of Fine Arts from Lindfield College, in McMinnville, Oregon; the Distinguished Service Award; and the Oregon Governor’s Art Award. Following her marriage to professional photographer Ray Atkeson, Mira adapted her interests and activities to his world of photography and enthusiastically helped Ray pursuit scenic beauty wherever they could find it—in the mountains and at the seashore, along forest trails, in high adventures among the glaciers and peaks of the Northwest’s Cascade Mountain Range, in the other Western States, Hawaii and even Europe. At first, Mira was devoted entirely to helping her husband in his work as she accompanied him on countless photography trips. Quoting her husband: “The help she gave me was immeasurable; moral support when I needed it, patiently waiting with me for desired photo conditions, camping and hiking during unpleasant weather, working in the office after I began my freelance career, and often staying home to take care of business when I was away on lengthy assignments, or when I was visiting winter resorts for a month or so each year. She suffered with me in adversities and rejoiced when there were reasons for optimism. It was a world of sharing in almost everything with countless concessions [compromises] on her part.” Eventually, Mira learned to love the art of photography herself and became an award-winning amateur photographer and, according to her husband, many of the pictures she took were masterpieces. Her famous husband admired her work and observed that she had her own approach to photography. Whenever the two of them chose the same subject to photograph, their pictures seldom turned out the same. In their camera club color slide competitions, Mira often won more awards than her professional photographer husband did. Mira loved the outdoors. She and Ray hiked, skied and climbed mountains all over the west and in many countries, including Switzerland. Mira made several climbs to the peak of Mt. Hood and even did this once in the middle of January. She also climbed the summits of both Mt. St. Helens (long before it erupted) and Mt. Adams a couple of times. She and her husband, with other climbers, additionally explored some of Mt. Hood’s glaciers. Mira’s greatest enjoyment was on timbered mountain trails and along the Oregon coastline, rather than the summit climbs to the higher peaks. Mira’s husband said that their most favorite area for outdoor activity was the coastal area of Oregon, in the fall. During this time of year the two of them loved to see the autumn fog veiling the ground and hovering over the land and seascapes. They both treasured the sometimes fleeting play of light among fog veiled coastal trees, as the sun illuminated a new day, creating countless pictorial effects in the photographs each of them took for others to enjoy. 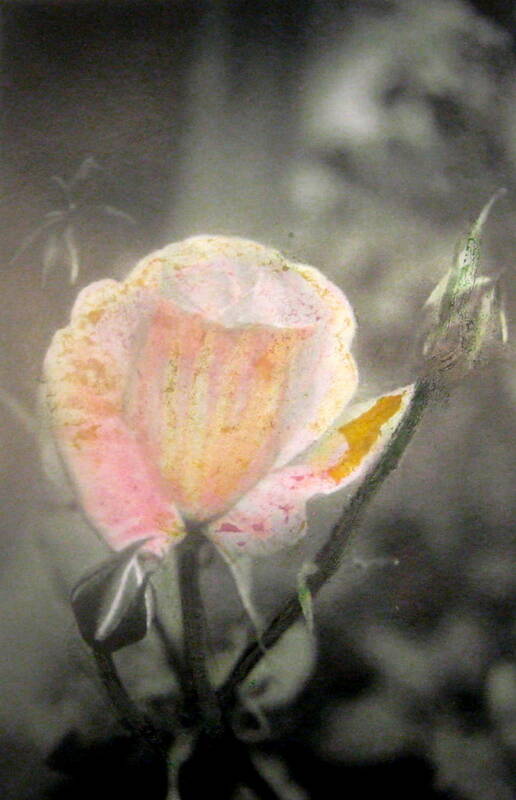 Mira Atkeson was a member of the Photographic Society of America, which had honored her with the A.P.S.A. ranking. 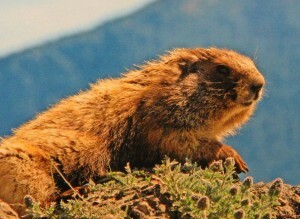 Like her husband, she was also active in the Mazamas and Sierra Club. Life for Mira was a sharing of love and beauty. She shared her knowledge and love of nature with her daughter Eleanor and the Campfire Girls of Eleanor’s troop. Eleanor was the Atkeson’s only child. 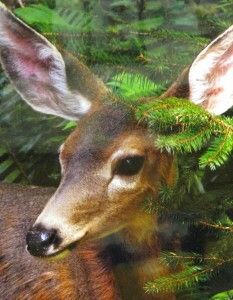 Mira also shared her time and talents with friends in the Forest Grove Camera Club and the Photographic Society. She additionally shared the interests and aspirations of her husband and worked with him to fulfill his career. Finally, Mira’s own photography was her way of sharing all of the world’s beauty as she observed and experienced it. Mira Atkeson passed away in 1976. In tribute to his wife, Ray Atkeson published a book The World of Mira Atkeson, which presents beautiful examples of Mira’s work and contains a sensitive and admiring introduction from her husband. A mutual friend of the Atkeson’s added poetry that she wrote especially for Mira’s book. Two of these poems can be found in some of the photo information. Ray Atkeson lived until 1990. 1. 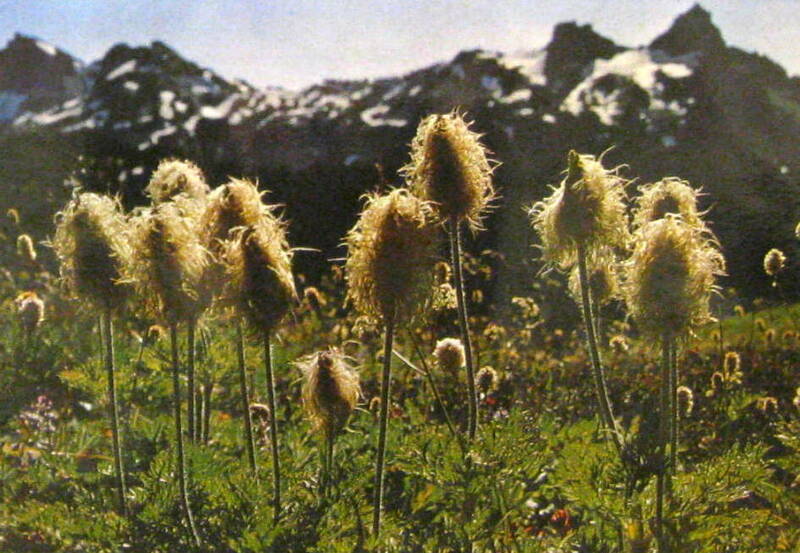 “Anemone Seed Pods” Photographed in Mt. Rainier National Park, Washington (Tatoosh Range in the background) by Mira Atkeson. This is a bug’s eye view of wildflower seedpods. How do you think the photographer captured a view like this? Mira probably was laying on the ground, with the camera close to the seed pods. This would be the view that a butterfly or bee would see. 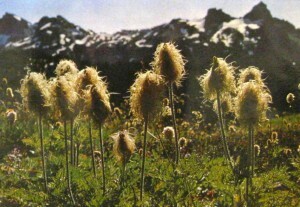 Anemone seed pods are often called “Old Man of the Mountain”. Take a good look at the seed pods in the photograph. Why do you think these seed pods were given this nickname? Maybe because they resemble an old man with rough and scraggly gray hair and a full beard, who isn’t worried about keeping neat, because he lives away from civilization and people. Are the seed pods an organic SHAPE or a geometric shape? Although they have a somewhat oval shape, the pods are found in nature so they are organic. *Very important for grades 3-5 to understand the differences in the definitions AND the terminology of LINE TYPE and LINE QUALITY. Try to cover these LINE terms and definitions in every presentation if possible. What different LINE QUALITIES can you see in the photograph? (Quality describes the appearance or width of any line. Some examples of line qualities might include: thick, thin, rough, continuous, broken, dotted, smooth, fuzzy, crooked, straight, angled, long, short, light, or dark.) Stem lines could be described as thin, straight, short HORIZON LINE could be described as jagged, rough, etc. What type of weather do you see in this photograph? Can you find any shadows in the picture? The seed pods are shaded on the side facing us because the light is shining on them from above, on the right. We are viewing the pods from very close to the ground. 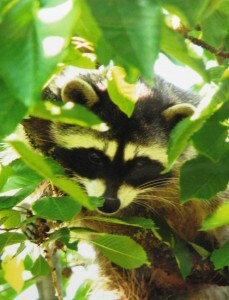 David Brower, an early ecologist of the Sierra Club and Friends of the Earth publication fame, once told Mira’s husband that he best liked the work of photographers who “got their knees wet”. What did the ecologist, David Brower, mean when he referred to photographers who “got their knees wet”? He was talking about photographers who did not mind getting wet or dirty when paying attention to the effect of a picture. These photographers were willing to be patient to take to best picture possible. Do you find the photograph interesting? Why or why not? 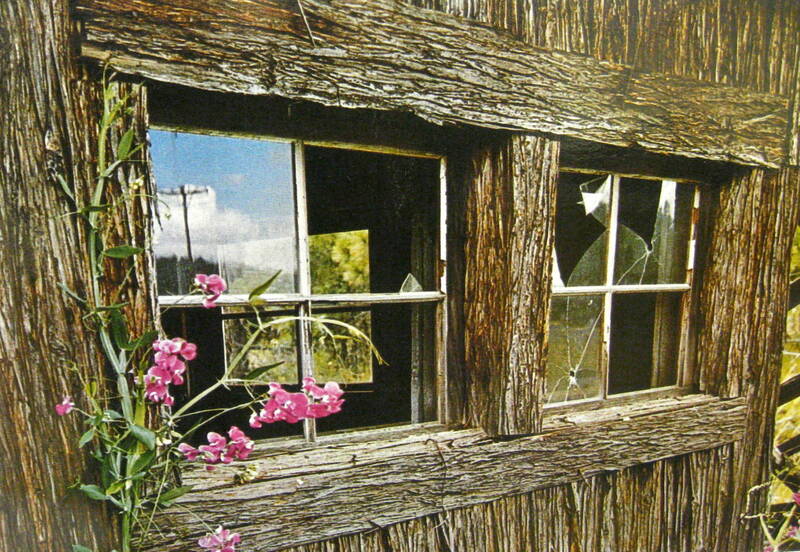 The thing we notice most in this photograph is the TEXTURE of the old wooden building. How would you describe the TEXTURE of the sweet pea plant? The window glass? Are there any ORGANIC SHAPES? These are natural shapes. The sweet pea is natural, also the evergreens and grass in the background, on the right. Why do you think Mira only took a picture of one small section of the building, instead of the entire building? She would have to move farther away to take a photo of the entire building. The rough texture would not have been so well defined. Mira wanted us to focus on the TEXTURE, SHAPE, and LINE of the scene. What the entire building actually looked like was not as important. How many COLORS do you see in the photograph? Most of the picture is the gray-brown of the raw wood siding. The sweet pea is pink with green vine and leaves. There are green evergreen trees in the background, seen to the right and through the far window. The trees are out of focus, mostly just green color. You need to look carefully to see the evergreen branches. There is yellow-green grass, lower, on the far right. Bring in large sized bark chips and a natural plant or flower. If the flower is in a pot, cover the pot with a loose piece of cloth. The cloth color should not be extremely light or dark. This will add to the texture of the scene. Arrange the bark chips and plant on a low table. Drape a cloth over a box to create a solid colored background behind the scene. Everyone can take close up photographs (3-4 feet away) of the arrangement from different vantage points. Take a photo from above, looking down on the scene, from below the scene (bug’s eye view), just a corner of the scene, from the side, only the bark, etc. Get close enough to the scene (3-4’) to only include the plant, the background cloth and the bark chips it is sitting on. It will be interesting to see the variety of views that can be created by simply changing the vantage point or leaving an area out. 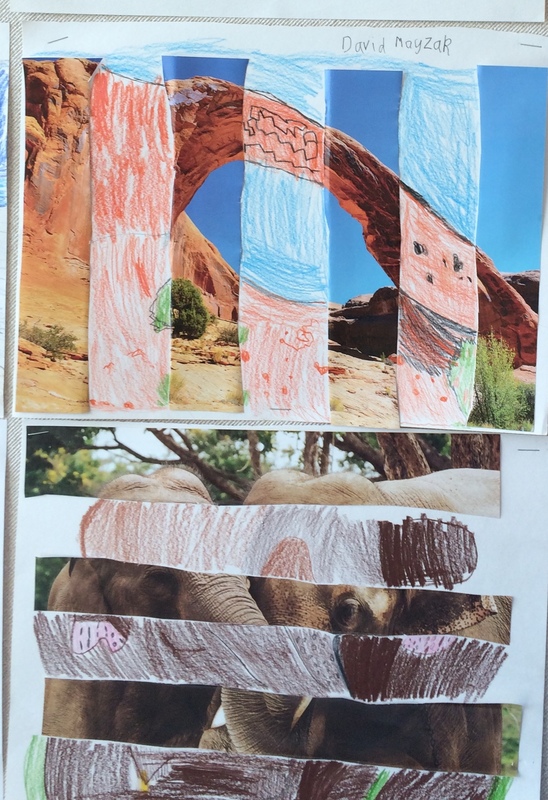 Have kids use a 4” x 6” construction paper frame viewer to help them see what the actual picture will look like before they take it. Bring in some interesting and fairly large (4” x 12”) moss covered logs found in the woods. Look for pieces with a variety of textures. Lay these on a black tarp for close up (3-5’) photos from different angles and vantage points. Bring a collection of things with PATTERN and TEXTURE (uncover the corrugated layer on a piece of cardboard, weathered wood, a brick, a concrete block, shells, rocks, chicken wire, etc.) Kids design different arrangements of three textures and/or patterns on a solid color, contrasting background and take a photo from three feet away. Show this photograph to the class before giving them any information on the subject. What does this photograph show us? Fallen tree branches and/or tree trunks covered with moss, in a Washington State Rain Forest, on the Olympic Peninsula. 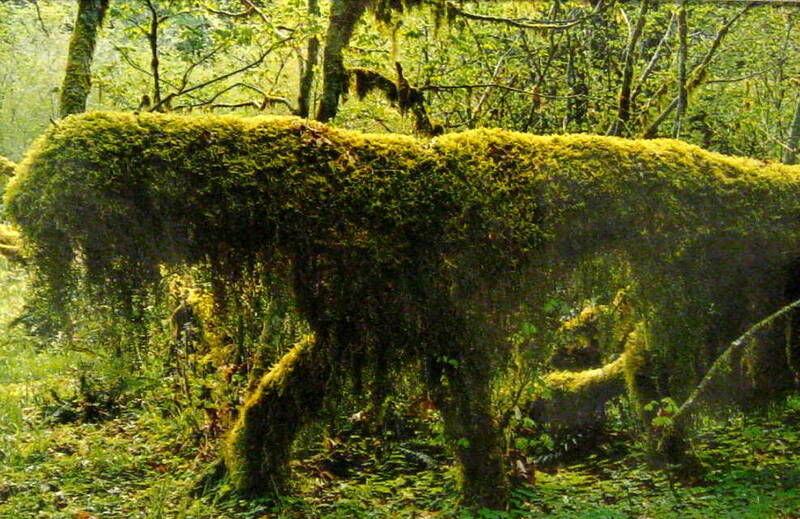 Because some of the moss is hanging, it resembles shaggy fur. If you use your imagination, it is fun and surprising to discover that the subject (focal point-center of interest) of the picture resembles a strange and very curious creature. What is a Seascape? An outdoor scene featuring (or including) the ocean or the sea. Ray Atkeson, Mira’s husband, specialized in Landscape and Seascape photographs. His spectacular Landscape photos advertised the beautiful views of Mt. Hood and Mt. Rainier and his Seascapes reveal major differences of Western beaches to people of America’s Eastern coast. These scenes made him famous. 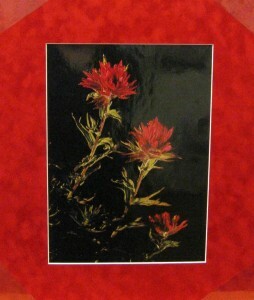 Mira’s specialty was her flower close-ups, although she was also fond of landscapes. This photograph is one of Mira’s very funny scenic landscapes. 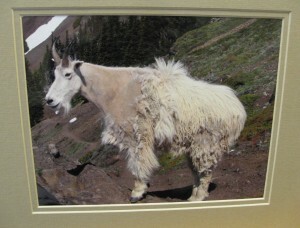 Although the subject resembles an animal, it is not a portrait. Here are two stories in Ray Atkeson’s own words about animal photography with Mira. The second story refers to this particular photograph. 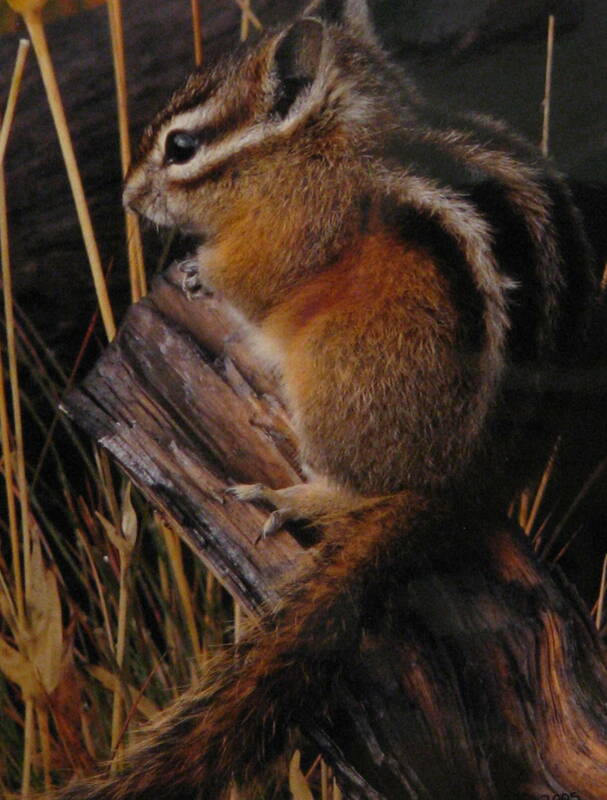 “Mira occasionally teased me about my animal photography (not one of my specialties). I recall some amusing and interesting shots she took involving animals. In one of those shots she caught me in a pasture beside my camera on a tripod. I was busy searching for a specific [camera] filter in a leather pouch attached to my belt while a curious horse, with head cocked to one side, was seemingly making a close check of my composition through my viewfinder. Another of her pictures, taken in Finland, caught a reindeer as it went after my handkerchief which protruded from my hip pocket as I was busy endeavoring to photograph other more elusive and distant reindeer in the opposite direction”. Drape a cloth over a table and a tall box on the tabletop, to create a solid color background. Gather an assortment of found objects (or send a list home ahead of time for kids to bring in for this project). 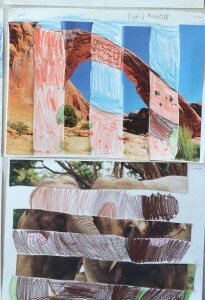 Allow kids to create an imaginary creature, stacking and arranging several objects, and then photograph it. Give kids a limited time for arranging their objects so that everyone will have time to take their pictures. Having two areas for this will help things go faster. Kids waiting their turns might be painting Color Wheels or Color Value scales. Consider teaming up with another volunteer to help this process run smoother. The teacher should also be consulted ahead of time for helpful suggestions and to enlist the teacher’s assistance. 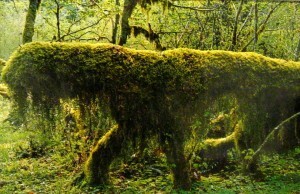 Compare this photograph, by Ray Atkeson, with Mysterious Olympic Rain Forest Creature by his wife, Mira. Which picture is the most creatively unique? Which is the most scenic? Which do you like the best? Why does the background of this picture seem so white, instead of blue or green? 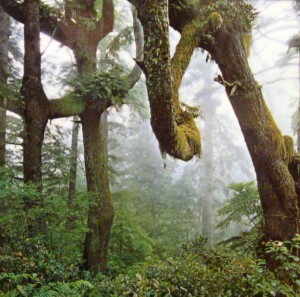 It is either foggy or rainy, both typical conditions in the rain forest. Ray said rainy or overcast weather is always more favorable than sunny weather for taking the best photographs in a coastal rain forest. The reason for this is that, as the sun shines through the taller trees, it casts dark shadows. The plants in the foreground of a photograph such as this would not be as bright if the picture were taken on a sunny day. Bright sunlight can glare and leave blank white areas where the sun’s reflection is strong. What do you see in the FOREGROUND of this picture? Ferns, small bushes and small trees, lots of green color. Where can you find TEXTURE in this photograph? The most obvious place is the tree bark but the bark also has moss and plants growing on it in some areas, which adds additional variety to the texture. How would you describe the texture of the ferns? How would you describe the texture of the greenery found on the branches of the smallest trees? Go outside and take a colored photograph using a tree as the main subject. Find a close enough vantage point so that the tree fills most of the photo. How about getting so close it is only possible to photograph one small section of the tree? This suggestion may create an interesting ABSTRACT looking photograph. Volunteer should bring in your own example of this attempt, if possible. 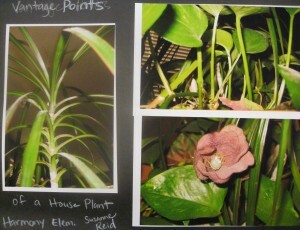 Take an outdoor close up photograph of plants. Bring an umbrella if it is a rainy day. Raindrops on the plants can make the photograph more interesting. Let kids use a small cardboard frame viewer that is the same size as the photograph will be, to help kids see how close they need to be to create the picture they want. Teacher (or another volunteer) could keep kids busy with a second project, while you take 2-3 kids outside at a time, to choose what they will photograph. 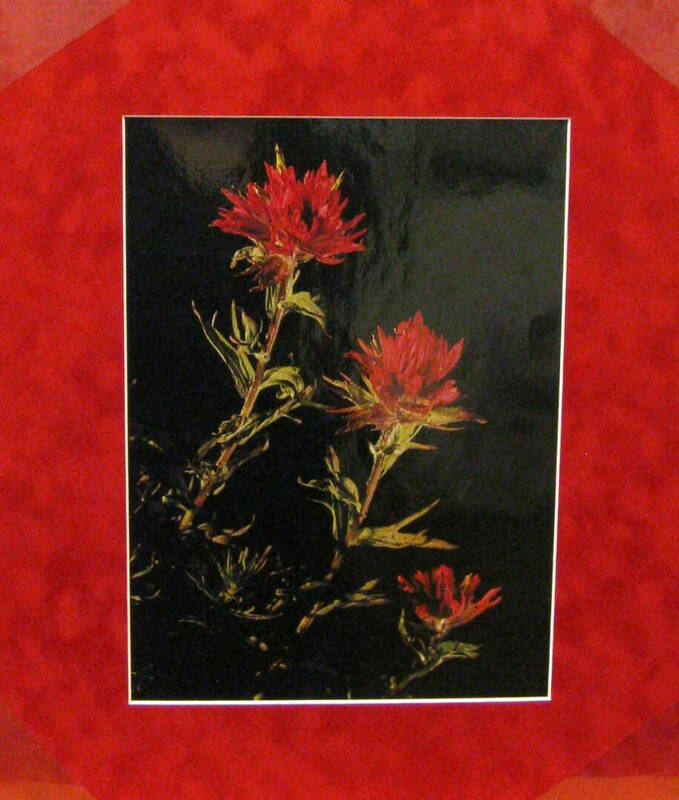 Paint a picture of a tree, using tempera paint. Tree should be large enough to fill most of the paper. Paint a picture of a forested landscape. Bring in a potted fern and let kids examine it closely before they draw and paint a close up picture of the fern. Drape a cloth or towel over a box behind the plant, to create a solid color background behind, and cover the pot with the same colored material. Arrange a fern as suggested above. Challenge kids to find an unusual vantage point to photograph the fern. 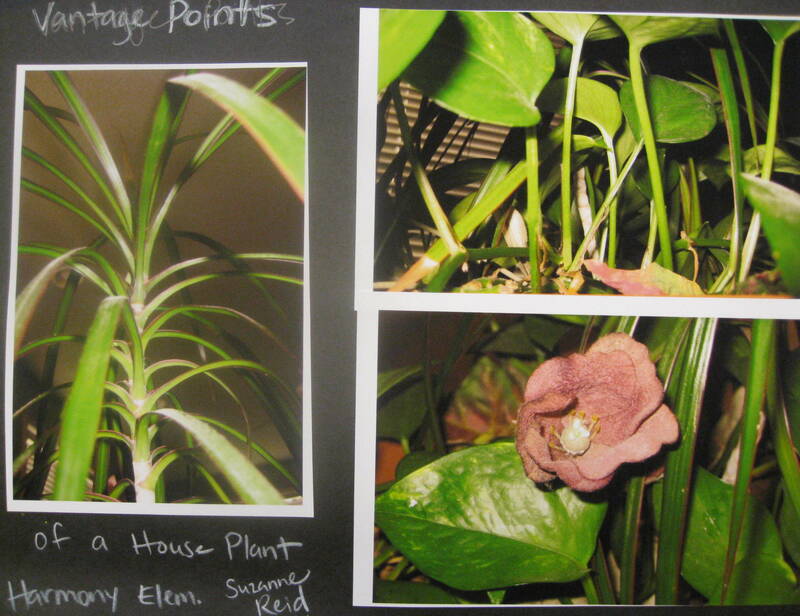 Remind kids they DO NOT need to photograph the ENTIRE plant. An interesting part of the plant might create an unusual pattern in your photograph. What about photographing a section of the fern from the underside? Encourage kids to come up with different vantage points and distances to create a photograph that looks different from the rest of the class. What about a perfectly SYMMETRICAL photo of a single centered frond, with the leaves projecting out the same distance on either side? How about focusing on the tip or base of the fern frond to show PROGRESSIVE RHYTHM (leaves get larger at base, smaller at tip—their size progresses). and it *wafts the sea. we can go quite far. *A mutual friend of Ray and Mira Atkeson wrote this poem to go with Seascape photographs in Mira’s book. This photographic Seascape was taken at the Oregon Coast, a favorite place for Mira and Ray. There is a hazy mist rising from the surf in the distance, below the hillsides. How many colors do you see in this photograph? Other than black and white, most of the scene is a gray-blue or a blue-green. 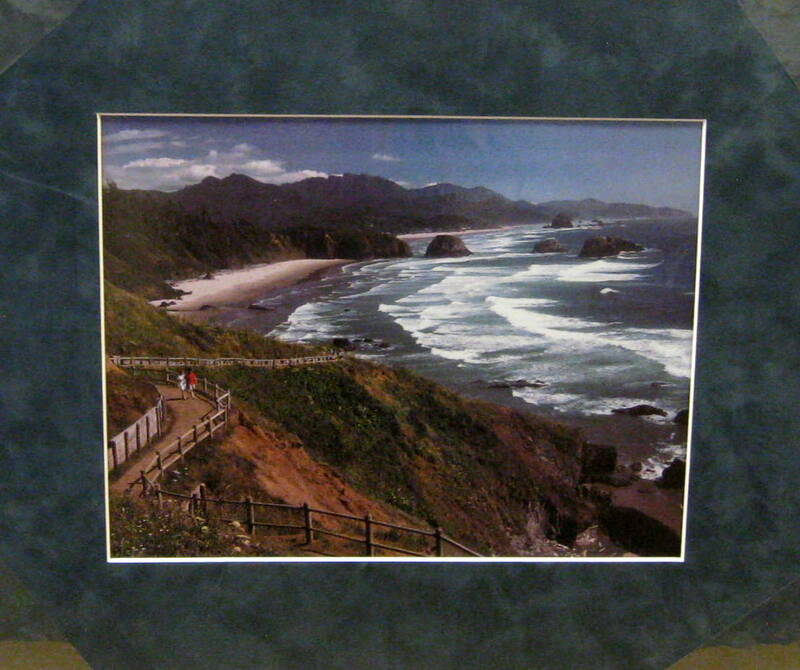 Compare this photograph with Ecola State Park, Crescent Beach, by Ray Atkeson. When we compare the two photographs, it is very obvious that the amateur photographer (Mira Atkeson) is extremely talented. Mira’s professional photographer husband won many prestigious awards for his scenic photography (although Ray’s wife won more honors in their amateur camera club). Mira closely observed her husband as he worked and learned much about quality photography long before she took a serious interest in photographing her own scenes. Once, her husband “fumbled the ball” on an important picture he was assigned to take for an Oil Company calendar. It was a view from a vantage point looking down on the bridge spanning the mouth of the Rogue River, on the southern Oregon coast. Because he was scheduled on another photo assignment, Ray didn’t have time to return to the bridge for another shot in time to meet the publication deadline. After some last minute instructions about using his camera, Mira boarded a bus for Gold Beach, where she managed to climb the high hill above the bridge, by herself, carrying the camera and heavy tripod. Mira located the same vantage point, returned home with some great color shots of the bridge, and helped her husband meet the publication deadline. Several years later, Mira joined a Sierra Club outing to Mt. Assiniboine Park, located in the heart of the Canadian Rockies. Her husband was unable to make the trip with her because he had to participate in a program for the National Convention of Professional Photographers of America, which was scheduled during the same time. Ray had a customer that he was fairly sure would be interested in a negative of Mt. Assiniboine. Mira packed Ray’s camera—in addition to her own, additional lenses, a tripod, sleeping bag, clothing, and food—into her backpack, which she carried on her own back throughout the long hike into the area. According to her husband, two very outstanding color shots from the 12-exposure roll of film she used were quickly sold. “I wish my average of successful commercial [professional] pictures were as good,” her famous husband pointed out. What do you see in the FOREGROUND of the photograph? What SHAPES do you see in the photograph? Are these shapes GEOMETRIC or ORGANIC (natural)? 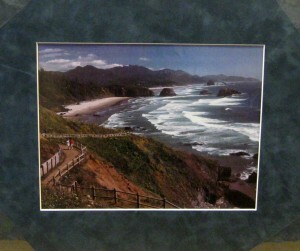 Compare this photographic seascape, by Ray Atkeson, with Oregon Coastline, Ecola State Park by his wife, Mira. 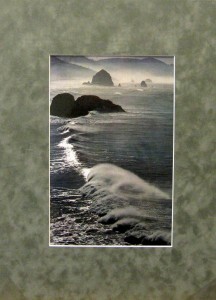 Each photograph depicts the same Oregon State seaside location. How are the two photographs alike? How are they different? 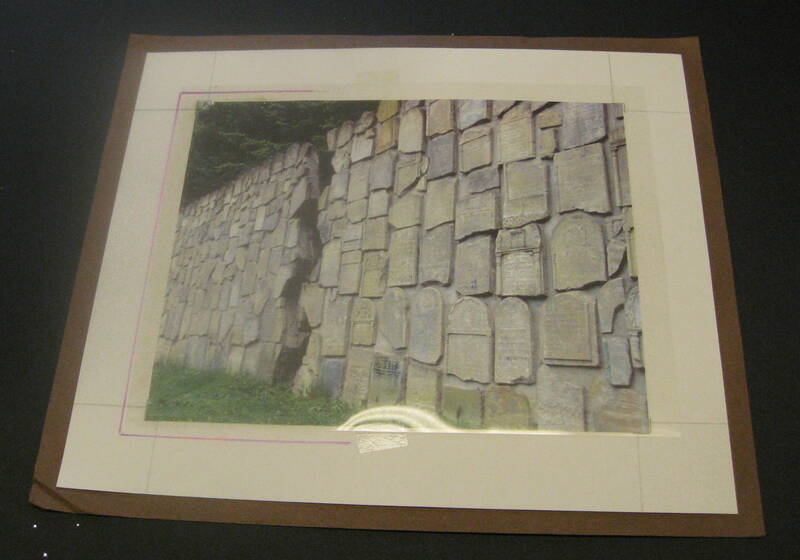 This picture was taken with a horizontal view (short and wide); Mira’s photo is a vertical view (long and narrow). Because part of the Landscape is seen in this picture, it is much easier for the viewer to imagine where the photographer was standing when he took it; Mira’s location is more mysterious because the landscape gives us no clues. In other words, the photographs were taken from different vantage points. In this photo, people can be seen in the MIDDLEGROUND, two to the left and a group on the trail behind these, a few inches to the right. (The size of the distant group of people is much smaller because they are farther away.). There are no people in the other scene. It is a much clearer, brighter day in this scene. The sky is very blue, with only a few clouds in the distance; a foggy mist and a grayer sky can be seen in Mira’s photo. There are more white capped waves here and a much larger area of landscape as well as water. The sandy beach can be seen in several places here but not in the other photograph. The two largest rocks out in the water, on the far left and close to the jutting rock outcrop, are not shown in Mira’s photo. What do you see in the FOREGROUND of this photograph? A winding trail down to the beach cuts off in the foreground as it rises above the seaside cliff. The photographer’s vantage point is higher than the trail ending in the picture’s foreground. 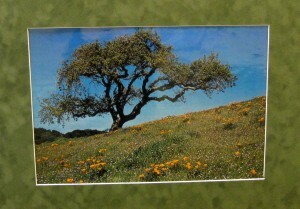 On the left, grass and wildflowers overlap the view of the trail. To the right, the view includes the rocks and sandy beach below. Paint or draw a seascape picture using one of these two photographs as your model. Many artists photograph scenes they would like to paint so they won’t forget what they look like when they get back to their art studio. Bring in a photograph you took of a seascape scene when you were at the beach. Project it on the large screen for the class to see. Kids can paint or draw this scene. Discuss the difference in style between a Realistic Seascape and an Expressionistic Seascape painting. 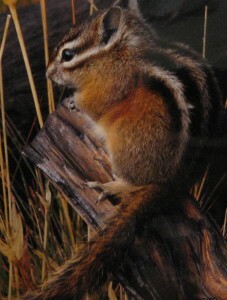 In a Realistic painting, the artist wants the picture to resemble a photograph of the scene. In an Expressionistic painting, the artist feels it is more important to create a MOOD for the viewer. An Expressionistic Seascape happens when the artist exaggerates or changes the color, line, shape, texture, space and/or even the movement or emphasis of the scene. The Expressionistic artist could create a red sea, a green sky, or a lavender shoreline. A realistic scene might be drawn and then colored using PATTERN instead of just color—polka dot waves, checkerboard shoreline, etc. to become Expressionistic. There is no limit to the way an artist might change a seascape to make it Expressionistic—only the artist’s imagination! Now, draw or paint an “Expressionistic” Seascape of your own. According to her husband, “Mira had an unhappy magnetic quality or something that attracted mosquitoes and other insects like a flower lures bees. Many of her potential pictorial subjects never found their way into the camera because of frequent battles with insects, causing her real agony as well as frustration. Insect bites usually caused painful swelling, which sometimes lasted for days and to add insult to injury, I was comparatively immune, sometimes not even realizing any insects were in the vicinity. She mentioned once that maybe the reason mosquitoes usually left me alone was due to something my best friends would not tell me. Anyway, she eventually designed an entire suit of netting which covered her head, limbs, and body. It wasn’t the most glamorous attire I’ve seen, but it sure was the answer to her prays on wilderness treks”. Mira was serious about her photography. She would spend hours on her knees for a single wildflower picture. Her husband made a point to note that she still kept up a good sense of humor while she waited with patience (and probably discomfort) for just the right moment to snap the picture. What LINE TYPE can you see in this photograph? Diagonal, even the SHAPES of the flowers are lined up diagonally. Compare this photograph with the Spider Web photo. Is the Background the same or different? 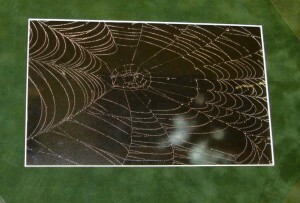 Both backgrounds are dark but light is reflected in an area of the spider web photograph and no light is reflected in this photograph. Mira has created dramatic CONTRAST with this photograph. Because the red and green are COMPLEMENTARY COLORS they have more CONTRAST and stand out dramatically against the dark background. come and see this grace. *A mutual friend of Mira and Ray Atkeson wrote the poem to go with this spider web photograph for Mira’s book. Spiders are nature’s master builders. They build with silk that they make on their own. A spider manufactures its own silk in tiny glands inside its body. The silk is a protein, similar to the protein in our hair or fingernails, made from little fiber-like molecules to make it strong. A single strand of spider’s silk is formed from a liquid ejected in a steady stream from eight tiny spinnerets on the spider’s abdomen. The eight thin streams join and harden on contact with the air. The strength of a strand of spider’s silk is about the same as that of a steel thread of the same size. Modern textile (fabric) industries have copied the spider’s technique to create threads of polyester and other synthetic fabrics in a similar way. 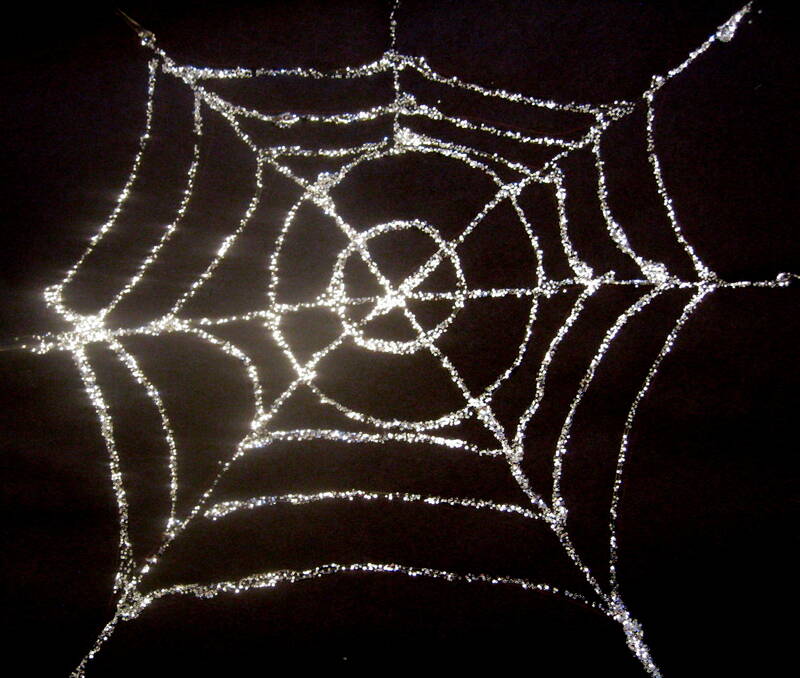 Spiders build webs to create traps or snares that catch insects for food. A spider’s silk is so strong that most insects can’t break through it. Some of the silk is also slightly sticky. An insect can’t fly or hop away once it is stuck in the spider’s web—the more it struggles, the more strands get stuck to it. Yet, spiders can move around easily on their own webs. An orb-weaving spider created this spider web. Scientists have found that orb-weavers stretch out their back pair of legs as they weave. This seems to be a guide that helps the spider measure and space the web fibers accurately. Scientists also found that if they destroy part of an orb weaver’s web, the spider reweaves the missing part. Sometimes it is hard to see a spider web. Why can we see this web so easily? The web is covered with little droplets of water, either from dew or rain. They seem to sparkle like little diamond dots. What type of PATTERN did the spider create? A spiral pattern. The web is also an example of RADIAL BALANCE. The spider weaves lines that radiate (move out) from the center of the web like the spokes of a bike. These radiating lines give the web strength. The spiral lines also move, around and around, from the center towards the outside edge of the web. Some of the spiral patterned lines seem to be missing in the center. What do you think happened? 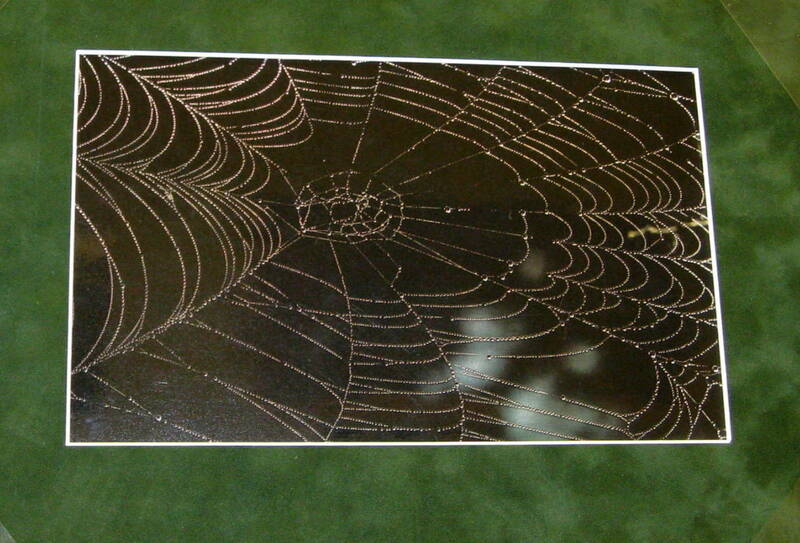 A person, a bird, or an animal may have touched the spider web and damaged it. The spider can repair its own web. Draw a spiral web pattern on a sheet of black paper. Web should fill page. 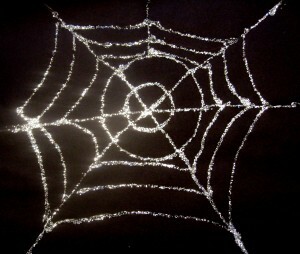 Use white glue to cover web with LINES or DOTS, then sprinkle with clear or silver glitter. This colorful rose was blooming in someone’s home garden, in Portland, Oregon, when Mira took a photograph of it. Portland is known as “The Rose City” and hosts the annual “Rose Festival” in the month of June. Portland is also home to Washington Park, with its beautiful and famous rose gardens. How would you describe the COLOR of this rose? What techniques has the photographer used to focus our attention on this flower? CONTRAST—the COLOR of the flower stands out from the TINTS and SHADES of green in the background. 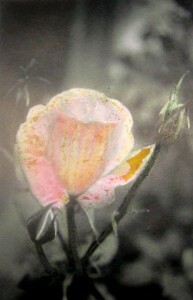 PLACEMENT—the flower is placed in the center of the photograph, slightly above the center. The artist focused on the flower, which is closest to the viewer (foreground). This causes the green leaves of the rosebush, which are farther away in the background, to blur together and create a solidly textured green background. There are probably other green things in the background, such as grass or possibly leaves from other types of garden plants. 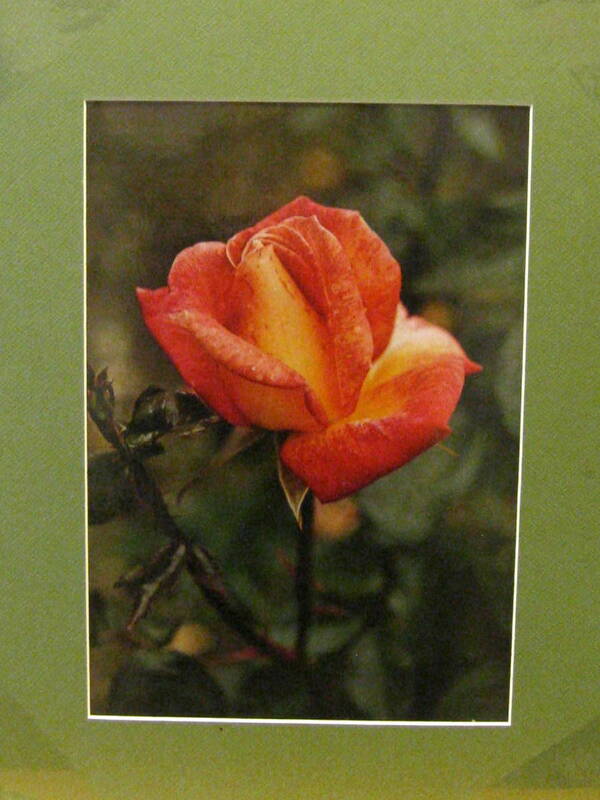 The photographer was very careful to capture only the green colors found behind the rose to use as the background. Do any of you have rose bushes in your yards? Roses have beautiful flowers on green stems. They grow as bushes and some gardeners have even trained them to grow on vines up a lattice or a wall. Have any of you ever seen the Rose Gardens at Washington Park? Bring in a real or silk rose. Examine with the class the way the petals move out from the center of the flower. The classroom teacher can assist by projecting the flower on the large classroom screen, as you hold it. Discuss this ahead of time with the teacher. Bring in a flower, a bouquet of flowers, or several flowers placed in single bud vases. Place flowers low, for kids to photograph from above. Place a green cloth or towel beneath vase, creating a solid green background. Camouflage cloth can help create a more interesting textured background. Another option is to put green cloth or towel on the wall behind the flower(s) and photograph from the side, emphasizing the blossom. 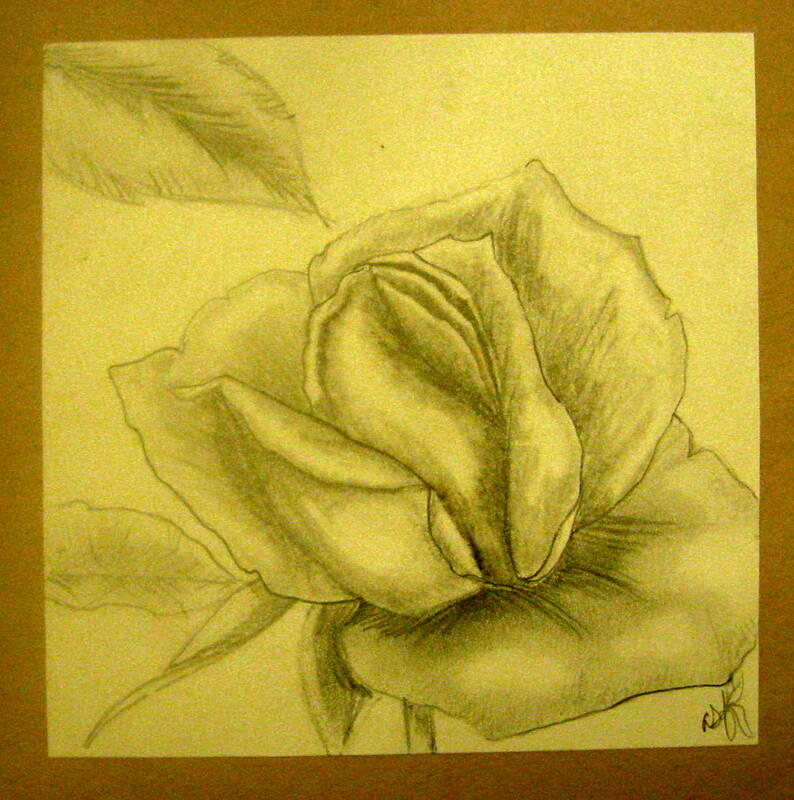 Draw and paint a Still Life of a bouquet of flowers (real or silk). Could somebody point out the HORIZON LINE in this landscape photograph? This is the imaginary line where the earth meets the sky. Which LINE TYPE is used for the horizon line of this photograph? Most horizon lines are horizontal but something which makes this photograph extremely interesting and unusual is that the horizon line is DIAGONAL. (K-1)This is the type of Landscape scene that Jack and Jill could easily tumble down, couldn’t they? The hillside is DIAGONAL. Can you notice how the hill on the right is higher than the left? Even the darker green trees on the hillside (OVERLAPPING behind) are not as high as on the right side of the picture. This helps form the DIAGONAL HORIZON LINE. What COLORS do you see in the photograph? What SHAPES do you see in the photograph? Are they organic (natural) or geometric? (3-5) Draw and/or paint your own imaginary Landscape with a DIAGONAL HORIZON LINE. (K-1) (Kids will probably need some specific advanced discussion before beginning this project.) Draw an imaginary Landscape (with a DIAGONAL HORIZON LINE) that Jack and Jill might tumble down. How might you draw the hillside steeper? The line should begin lower on one side and end higher on the other side. Just draw what the landscape (outdoor scene) looks like and pretend that Jack and Jill have not tried to climb the hill yet, to fetch their pail of water. Be sure to draw the well at the highest part, or the top, of the hill. Add a tree near the center of the hillside, along the horizon line. Should the direction the LINE of the tree trunk you are going to draw follow a diagonal or vertical direction? Look at the one in the photograph before you answer. Scout the area before you begin. Figure out what will make a good picture and when the light will be just right. Shoot photos as the sun comes up and as it goes down, when shadows are broad and colors are intense. Look for COMPLEMENTARY COLORS. Photograph trees with orange leaves against a blue sky or red flowers in a field of green. Search for PATTERNS and SHAPES, such as a row of tree trunks or rocks in a riverbed, to make photographs more dramatic. Try shots with your main subject off to one side, or near the top or bottom of your photo, to create an “off center” BALANCE. Scenes are much more interesting with asymmetrical balance. Make sure the land and the sky do not always meet in the exact center of your Landscape photo (HORIZON LINE). Make the picture one-third land and two-thirds sky, or one-third sky and two-thirds land. Another interesting thing to try is a DIAGONAL horizon line. Use LEAD-IN LINES. Compose your photograph with a road, trail, or fence line that starts somewhere out of the frame and runs right into the picture. SHOOT, SHOOT, SHOOT! Take loads of photos. As with any other skill you learn, the more you practice, the better you will become! 2. Draw a line around the can, about 2” from the bottom. 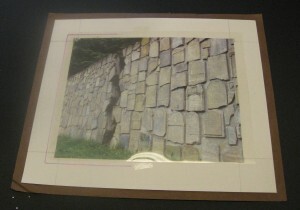 Use an X-acto knife or a utility blade to cut along this line. You’ve made a camera! This kind of camera is called a camera obscura—which is Latin for “dark chamber.” The first camera obscuras were small rooms that were completely dark, except for a tiny hole in a wall that let in a dot of sunlight. People in the room saw an image of the trees and sky on the wall opposite the hole—and were amazed when the image disappeared at sunset! The hole doesn’t make the picture you see when you look in your Pringles® can. The image of the world is always there. The hole only makes it possible for you to see the image. Suppose you point your Pringles® Pinhole at a brightly lit bouquet of flowers. Light reflects off the red rose, the blue iris, the white daisy, and the green leaves. If you hold a piece of white paper near the bouquet, some of that reflected light will shine on the paper—but it won’t look like anything. That’s because light bouncing off the red rose ends up overlapping with light bouncing off the blue iris, the white daisy, and the green leaves. There are many images of the bouquet on the paper—but they overlap with one another, and the colors all blend together, making a jumble of light.